Imagine this: You guzzle water on the reg, down your post-sweat protein shake, and show up for your morning workouts (most of the time)—but feel like you’re not seeing any progress on the fitness front. If this sounds familiar, what gives? Actually, the culprit might be sleep—or lack thereof. It’s well documented that insufficient rest can cause brain fog and extreme yearning for your bed circa 4 p.m. But it can also deter your workout returns. But there’s a way to hack your sleep cycle to get the shut-eye you need: ORB Sleep Complex, a time-released supplement that taps melatonin to ease you to sleep at night and B12-boosted energy to help you wake up in the a.m. To help you squeeze more out of your 7 a.m. spin classes and full-body blasts, we asked Parker to break down why sleep is so important for your fitness goals (and how ORB can help). Scroll down for 3 reasons why sleep is crucial to your workouts, and how this one supplement could help. Sleep deprivation doesn’t just result in feeling seriously bleh: It can basically cancel out the benefits of your workout. “Sleep affects the way your body metabolizes the nutrients you feed yourself and it plays a vital role in how quickly and completely your body is able to recover,” Parker says. In other words, if your body can’t tap the nutrients it needs for fuel and can’t recover from that round of burpees, you aren’t doing it any favors. Not getting enough sleep also increases levels of the stress hormone cortisol and lowers levels of human-growth hormone, which is essential to tissue repair, according to Parker. And if you’re completely wiped after 15 minutes of running (when that’s not the norm), you can also thank your lack of time under covers. That all has to do with glycogen, which is the store of carbohydrates (AKA fuel) your body keeps. “With the decrease in glycogen synthesis that occurs along with sleep deprivation, it’ll be harder to store glycogen which can have negative impacts on performance, especially for endurance athletes,” Parker says. A natural way to promote deep, restful sleep, though, is popping an ORB Sleep Complex supplement about 30 to 45 minutes before hitting the pillow. Because of the time-release technology, you get the ingredients you need when you need them (uh, genius). First, outer layers of L-Theanine (a natural antioxidant), plus an essential-oil mix of lavender and ylang ylang boost the calming vibes. Then, melatonin and valerian promote and regulate sleep (no 3 a.m. wake ups). Lastly, as you rise, vitamin B12 gets to work to help energize you for the morning. Go ahead and swap that supersized matcha for a small. Step one: Stick to a routine. 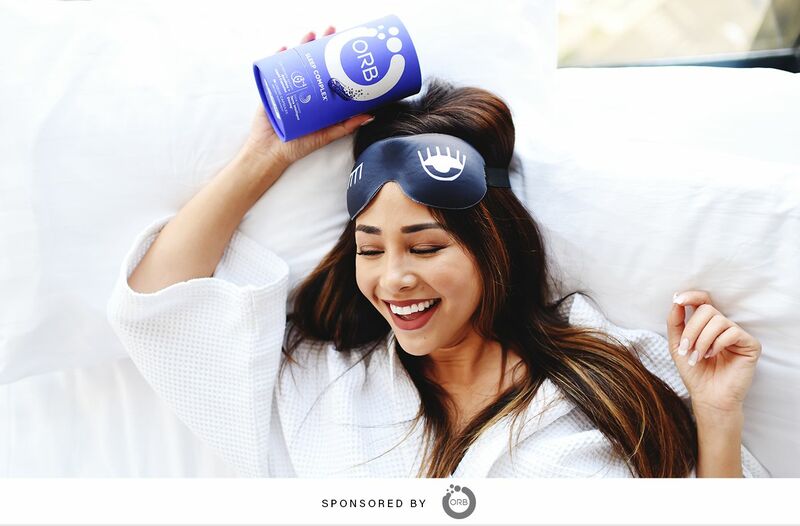 “To ensure you are getting time-released melatonin that helps you fall (and stay) asleep, set a strict schedule of getting up and going to sleep at the same time each and every night—yes, even on the weekends,” Parker says, who recommends this in addition to taking ORB Sleep. To do so, identify the morning you need to get going earliest, and count backwards seven or eight hours to pinpoint your perfect bedtime. Then make sure you’re giving yourself a solid half-hour wind down before you turn out the lights each night. If all else fails, get yourself a sleep mask (or a set of blackout curtains). “The number one piece of advice I can give to help improve the quality of your sleep is to create a completely dark environment,” Parker says, noting that clients have raved about passing out blissfully once they pop on a sleep mask. So supplement, accessorize, and sleep easy.